D Kennell posted this beauty on Thingiverse, I am a sucker for extruded aluminum and Brustruders (I did design the 1st one so what do you expect?). This looks like the dark Cthulhu spawn of a ORD, Thingomatic, and Mendelmax I can't find video of this printing yet but man its awesome looking little bot? I can't wait to see more out of the development. Pronterface update for Windows & Mac! -Experimental projector stuff: The folks over in the Lemoncurry SLA RepRap channel are using Pronterface to control the projector between layers. Kliment has made this functionality part of the main branch of Pronterface. -Temp graph: With the troubleshooting I do in the RepRap IRC, I find a lot of people have very poorly tuned PID settings (swings of 10C are way more common than they should be). One easy way to get people to fix it is to put a temp graph on in the host software. Unfortunately PID tuning can be a bit of a pain, fortunately EvdZ has added AutoPID tuning to Marlin..
-Slic3r as default (and bundled): Slic3r is my preferred Gcode generation software for RepRap, and Kliment has integrated it into Pronterface from the start. With Slic3r if you have all 4 of your axis calibrated, and give it the proper Filament/Nozzle diameter, you should get almost perfect prints out of the box. Of course getting people to properly calibrate before using their magic machine is like pulling teeth! PID is what controls the way your firmware flutters the power to the Hot End of your 3d printer to keep the temperature even. Unfortunately it's not as easy as just turning the power on when too low and off when too high (Which is for the most part how Hot Bed are controlled), because if you do that you end up with a HUGE 20-40C swing in your nozzle temp. Most people with untuned PID settings are only getting 5-10C swings but for good quality prints the temp needs to stay dead on one temp or the qualities of the plastic will randomly change during a print. There are some good guides out there for PID tuning, but no matter what it requires a bit of algebra and experimentation to get it right. try to calculate the PID settings that best match what your hardware is achieving. Be sure to let it run its cycle 4-5 times before you write down the values, because each time it calculates the PID it live updates to the new PID, bringing you closer to perfect PID tuning. After each rotation of calibration if will give you a value for the Kp, Ki and Kd using a standard, some overshoot, or no overshoot profile. You then load the copy of Marlin you have on your computer, open Configuration_h, search the word "PID", and change the values for Kp, Ki, and Kd to the new values of your choice (EvdZ suggests some overshoot for faster warming of the nozzle), compile and reupload. When I did this I went from having a 3C variation (I know, here I am wearing an admin feather ha5 and have a 3C temp variation on my hot end... bad me), to having a .1C variation +&- of the value requested. Lulzbot (which posts things to Thingiverse as AlephObjects ) has developed a Mendel sized alteration of the Mendelmax format. Honestly my Mendelmax uses All the RP parts from MiniMax with the extrusion lengths of a Mendelmax. Lulzbot is not going to be selling a kit for this machine, but selling it fully assembled. But like any company I love they are following the release early and often philosphy. If your like me and love self sourcing printers all the parts to assemble this bot in it's current state have been posted to Thingiverse. Jebba assures me that the design is no where near done, they have some more work they want to do on the Z axis, but they will continue to post the STL for the upgrade to Thingiverse. They have been getting Ultimaker + X/Y speeds & zero Z wobble on this machine. I can't wait till they post a video of that! It's truly amazing to see how fast the DIY SLA group is progressing in the Lemon Curry IRC. It seems that you can get faster development when Resin is $40 a quart. After asking Joe Moe/practicing01 who had the best print quality I was shocked to see this print by Arthur. That's a lot of progress for 1 week! Brian Benchoff of HackaDay wrote a great article expressing his opinion of what is wrong with RepRap. He made some very interesting points. As one of the 20ish Admins that he seems to be interested in vesting with power over the future of Reprap, I figured I should respond to his coronation. I try very hard to be 100% positive on this blog since Adrian was nice enough to get my keys, so my response is over at my personal Blog where i an be a bit more blunt. But to sum it up quickly, RepRap is 100% controlled by those that do, not those that dictate. Adrian, and the Admins try to exert as little control over this community as we can, and to date that has been effectively none. 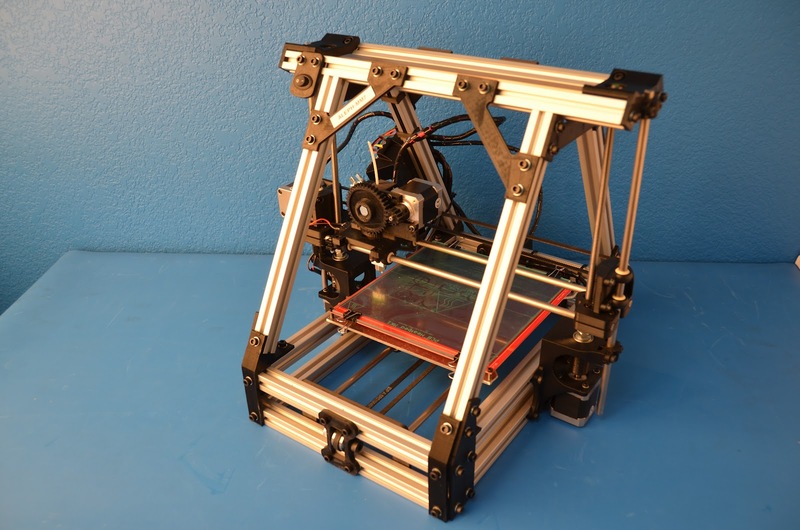 The front page of the Wiki is pretty self explanatory, if you don't know what to build, build a Prusa (Every RepRap listed on the front page has some basic instructions and has printed before so no reason to get rid of them). We refuse to pick a commercial provider that is the "official" RepRap because there is no way for that to be fair. IMHO the "official" RepRap is find a friend/org who owns a 3d Printer, hang out at their place for 14-20 hours and print your own, or bribe them with a few cold drinks to print it for you. Find the components you like, and build your self one for $400-$700. Enough of that, now back to those awsome people that really run RepRap, the devs. For some people an Arduino is just not going to cut it, they need to feel the power of an ARM Cortex M3 to feel truely happy. Smoothie firmware and electronics have been in active beta testing for many weeks now and it looks like Arthur will actually make his Juneish timeline for his Smoothieboard. 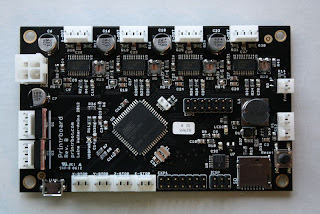 If you want to join him in the beta testing, Arthur and his team have put together a breadboard version of their electronics you can test now on your RepRap, Lasercutter, or CNC. DLP-Based Resin RepRap, ohh and $40 a Quart Resin! ScibbleJ did a great write up on a DIY DLP Projector based resin 3d Printer he has been working on. 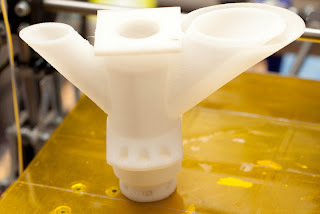 You might wonder why RepRap, an org based around accessible 3d printers would be intersted in a printing technology that requires $400 a liter printing solution, well part of the reason is Bucktown Polymers (started by A2Sheds, developer of the Lemon Curry DLP based Resin Printer) is selling Resin for DLP printing for $40 a quart. That's almost as cheap as PLA! Different project entirely but that's what the goal is. Ohh isn't the future grand! Wait 3 months for an update, then 3 days? Sorry Some times things are so cool, and not published about I have to update you guys. I LOVE RepRap. All I can say is I hope he had eye protection. Any person that has ever used a high power laser must have jumped behind their desk chair when they saw a UV laser pointed at a shiny plate like that. But beyond that, WOW that is awesome! Alan Mckierman has more of his stuff over on his blog. I have not seen any videos/posts since his post in January, hope he is not in the burn unit! Claire Warnier and Dries Verbruggen, the founders of Unfold based in Antwerp, Belgium have posted a video of their modification of the Moineau Paste Extruder on YouTube. 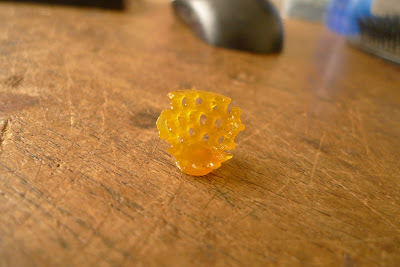 I have never seen a paste extruder that gives that consistent of a bead. I can't wait till they post more details about their modifications. One of the best things about RepRaps is you can run as many RepRap as you want off one Laptop, and if you have an LCD and SD card reader on a machine you can run them with no computer at all. Adrian Bowyer has in the past compared RepRap to Chickens, but honestly no chicken coop is as fun to watch as a "flock?" of RepRap. Marlin has finally reached ver1.0! The list of improvements is is too long to mention. 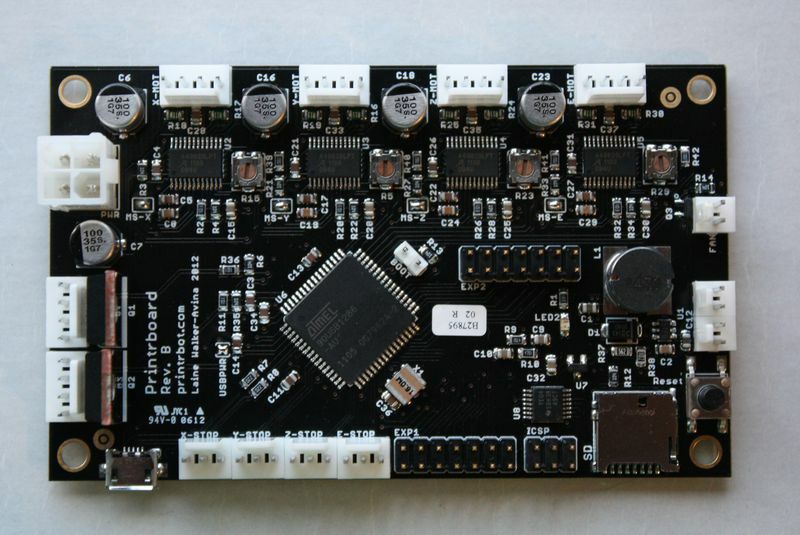 Marlin is the firmware out there that gives you the most control over every aspect of your RepRap. Marlin can leave you a bit overwelmed because it gives you so much control of every aspect of your bot, but his can be mediated by using Daid's great web app for setting up Marlin. From what I have seen Marlin works great on almost any machine you throw at it. Marlins specialty is dealing with Bowden cable extrusion. *Sorry I goofed the name at first Daid! Would figure the name of the website would be enough of a hint! 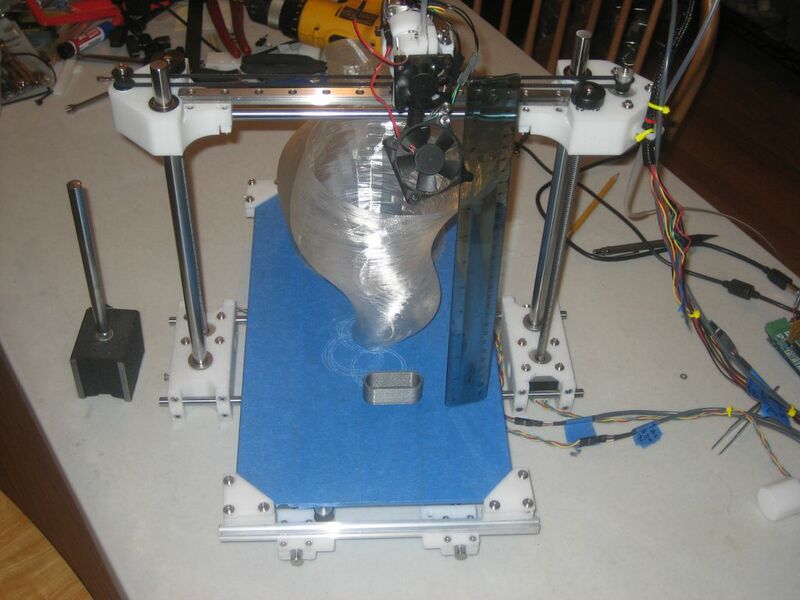 Credit RichRap who writes a great blog and is selling his RepRap on Ebay! Sprinter Firmware gets Look ahead! Marlin might be the firmware for RepRap with every knob exposed, Sprinter is one of our most stable/easiest to work with firmwares out there. Kliment, the maintainer of Sprinter has accepted a pull request that puts look ahead into Sprint Firmware under the experimental branch. All the beauty of look ahead firmware with the eaes of use of Sprinter. Fun! Printrbot, and it's earlier released cousin Wallace have really made a spash, and finally Brook and his team at Printrbot have opened their store. On offer they have a $550 RepRap kit, which puts them at the lowest cost RepRap kit in the world to my knowledge. Congrats guys and good luck! A small note, The Wallace/Printrbot design does reduce the cost of a RepRap by around $50 dollars by reducing the frame reinforcements. While at low speeds this is not a concern, at higher speeds, and especially at higher speeds and higher Z axis positions this can significantly reduce build quality. But on the other side of things if you purchase the Printrbot kit, and wish to upgrade the machine it should be no more complected than purchasing more fasteners/rods/belts and transferring the motors/hot end/electronics and some of the RP parts to a full sized Prusa or MendelMax. Second note I have seen no independent reviews of the electronics or Hot end yet, so unless you like living on the edge I would hold off on a purchase until the Hot end/Electronics have had time to be kicked around by the community. 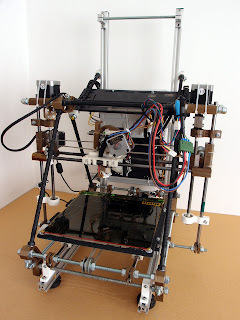 RepRap build parties are getting more and more popular, with them happening all over Europe and the US. These are hugely popular because it's a win for all involved. 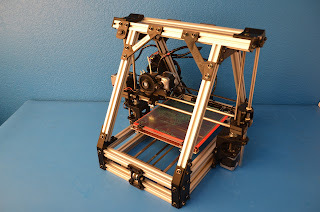 For a person getting involved with RepRap they get a RepRap for just a bit more than the normal price to self source one ($400-$650), ease of assembly, plus support from start to finish. I have yet to see the build party that didn't have the vast majority of particepents leave with a fully calibrated and assembled machine. For the people putting them on they usually make enough to compensate all involed and have a 3 day robot party. When I took on trying to update the front page of our Wiki to add MendelMax (Because I thought it was a shame that Prusa was very popular for many months before we got it on the front page), and I wanted to add Wallace/Printrbot also (even though I HATE the sacrifice of print quality to save 50ish dollars), I didn't realize it would be so contentious. Sad thing is I find myself agreeing with both sides of all the above issues and have no clue of a fair way to handel the front page. I draw the line that the front page MUST, have RepRap Pro Huxley, Prusa, MendelMax and Wallace/Printrbot. The issue is that Printrbot, MendelMax, and RepRap Pro Huxley are all "commercial" designs that are pretty close to non commercial designs... how do we say yes to them and Not also have Longboat Prusa, Luzlbot Prusa, Ifeelbeta Prua, Clonedel Prusa, etc etc also up there, and then by all things reasonable how do we put them in a fair order? I don't know, would love to know if the community has a simple fair way around this problem. Nophead has been teasing the community for weeks with his Mendel90 design. It's finally been released for your printing pleasure. It's printed mass is a little higher than Prusa and a little lower than Mendelmax. Will be interesting to see how popular this design becomes! Thanks Nophead! Note Nophead has released the source! (Thanks jamesmoe from the IRC). Rick Pollack, the man behind the MakerGear Prusa and Makergear Mosaic has came up with a new design for a Printer. At 1st glance I really though it was a knockoff of a Wallace/Printrbot, but he was actually working on it before either came forward (And when you look closer, while it might have the same general shape, it's approach at ever corner is drastically different). 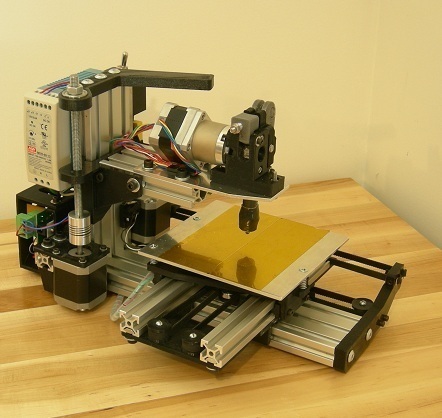 He is trying to determine if the community would be interested in this as a commercial product, or even as just a RepRap. Why not go over to his IRC and let him know what you think?